CDC Boosts Its Light Footprint In Congo's Ebola Crisis Zone : Goats and Soda The U.S. Centers for Disease Control and Prevention is dispatching a dozen additional staff and sending some of them closer to the area of the outbreak. Health workers inside the "red zone" of an Ebola treatment center in Butembo, which was attacked on March 9. The U.S. Centers for Disease Control and Prevention has had a light presence when it comes to the Democratic Republic of Congo's Ebola outbreak. But now that is changing. Dr. Robert Redfield, the CDC director, tells NPR that he'll be assigning about a dozen health experts to work in the DRC for a year and positioning at least some of them much closer to the epicenter than earlier teams. The last time U.S. personnel traveled anywhere near the outbreak zone was last August, when a team of three CDC experts and one USAID staffer arrived in the town of Beni several weeks after the current outbreak was declared. Days later one of the scores of rebel groups active in that part of Congo attacked a nearby military base. The U.S. State Department – which has authority over security for all overseas U.S. government employees – immediately ordered the team out. And from that point the State Department restricted the CDC's Ebola experts to Congo's capital, Kinshasa – on the west side of the country, nearly 2,000 miles from the outbreak zone on the eastern side. CDC has also deployed teams to assist officials at the World Health Organization's headquarters in Geneva. This approach stands in contrast to the much more robust role of WHO and private aid organizations. 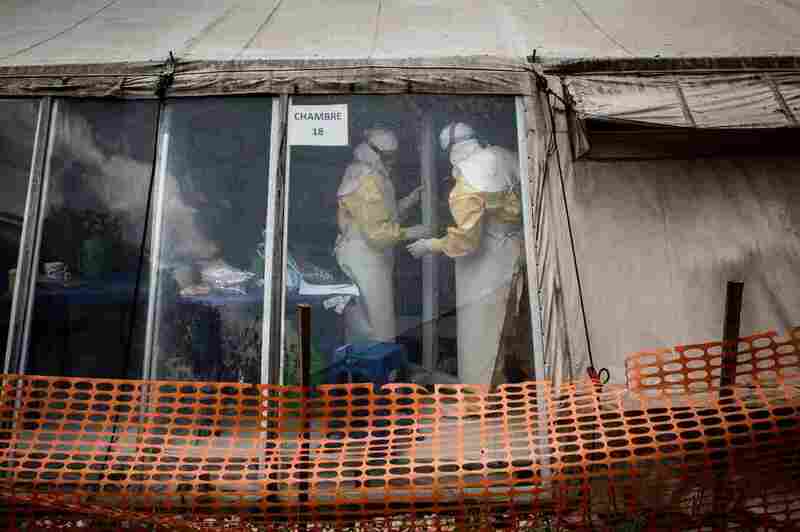 They've sent hundreds of health workers to the outbreak zone – supplementing thousands of on-the-ground responders employed by Congo's government. And these health workers have stayed the course despite repeated instances of violence, including not just clashes between rebels and government forces but direct assaults on Ebola responders. Last month, however, the aid group Doctors Without Borders suspended work in the epicenter after armed men attacked two Ebola treatment centers operated by the group. Redfield, fresh off a fact-finding visit to the outbreak zone last week, told NPR there's a limit to what CDC experts can accomplish when they are so physically removed from the epicenter. For instance, a crucial role of the CDC is to provide highly technical training to Congolese health workers who are directly managing the response. Redfield says these health workers need to be people who hail from the outbreak zone rather than from the capital. "Each of these communities are different. Each of these communities speak multiple different languages," said Redfield. "And we're trying to gain community trust. So if I go in and speak English or even one of the DRC languages of the [capital] area, I'm an outsider. We realize that in order to train the people that give us the best shot of gaining the trust of the community we needed to move those training activities to the region." That task has been made easier by the Congolese government's recent decision to consolidate coordination of the Ebola response in a new center in the city of Goma. Although it's still about 200 miles from the city of Butembo, around which the outbreak is currently raging, Goma is at least the capital of the province where Butembo is located. Redfield said he has already gotten approval from the State Department to send three CDC trainers to Goma. He's hoping they'll soon be joined by about seven more. Just as important, he said, he's extended the tours of these CDC experts from 30 days to one year. So far, nearly 1,000 people have been infected in the outbreak. "Don't think you're going to sprint to the finish here," Redfield said. "This is a marathon. It's going to be many months before we can celebrate the end."